The major 1995 revision of the Louisiana Law of Sale impacted all sales of land, buildings, and movable goods. 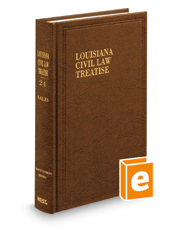 Every legal professional in Louisiana whose work has any intersection with the broad area of sales law requires new tools to understand the relationship of the sales title to the rest of the Louisiana Civil Code. With Sales, judges, lawyers, and other legal professionals will benefit from the insights of noted experts Dian Tooley-Knoblett and David Gruning addressing every aspect of the law of sales.